Today’s post is a little different to usual, it’s a Q&A session and an opportunity for you to learn a little more about how I came to be a personal stylist, how I grew my business and what I wish I’d done…or not done! I share post after post giving you tips on how to grow and develop your style and closet but today, after receiving the 100th email from a budding personal stylist asking me if I’d mind answering a few questions about how I started my business, I’m sharing my answers to the most common question I receive. I know how hard it is to get a business like this off the ground and to make a success of it, and I also know how hard it is to pluck up the courage to ask a peer for advice (I’ve been there myself!) so when a budding stylist reaches out to me for advice or help, I can’t ignore them. I’m sharing the highs and lows of being self-employed (and oh how high those highs are, and how very low the lows!) 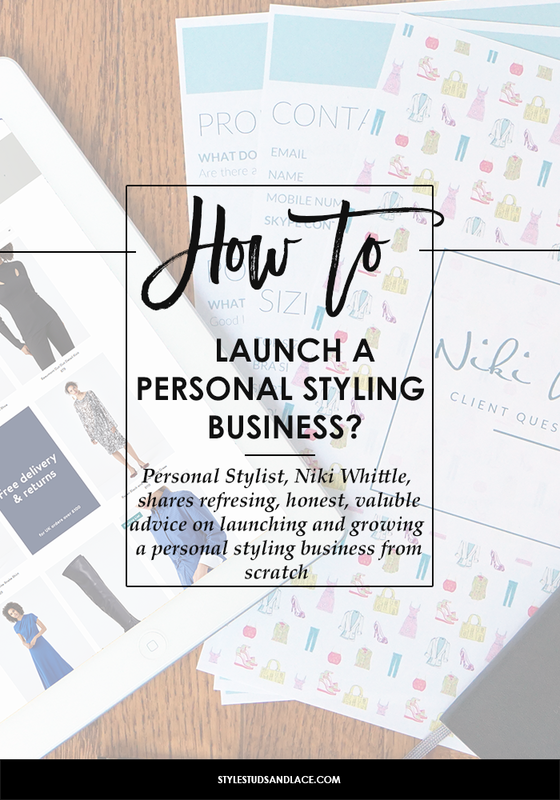 and am giving you an insight into what it takes to grow a successful personal styling business, should you wish to start, grow and develop your own business (personal styling or other) or know of someone who dreams of being a personal stylist. But before I go into the Q&A session , I want to share a little of my background with you. I’ll warn you though, it’s lengthy, but I thought you might find it interesting to hear a little more about how I came to be where I am today. However, if you’re short on time or have heard it before, feel free to skip this next bit by clicking here to go straight to the Q and A. Not skipping by? Alrighty…I graduated from University with a Textile Design Degree and spent the next few years working in retail and designing fashion fabrics – freelance – whilst trying to work out what I wanted to do with my life. I knew that whatever I did, it had to be creative. But that was about it. I applied for a variety of jobs and eventually secured a position as a Visual Merchandiser (VM) for John Lewis (a major UK department store). I thought my dreams had come true; that I was finally on the path towards a successful creative career, only to discover that the job was mundane and wasn’t the creative outlet I had hoped for. I was working full time as a VM, and part time as a freelance textile designer, I was tired, miserable, and my confidence was at an all-time low thanks to a section manager who never challenged me and couldn’t really be bothered to teach me anything. The only time I enjoyed my job was when I was styling the mannequins in the fashion department, where I was allowed a little more freedom to be creative…and discovered my love of layering (back then, the store I worked for didn’t have the fantastic stock it has today, but I quickly learned to mix and match and layer pieces to bring them to life). Some of the mannequins I styled were located outside the Fashion Advice room, and I’d see Deb, the only Personal Shopper at the time, running in and out of the room with mounds of clothes, laughing and chatting with her clients as she sourced new collections for them. I saw women enter the room, most of them nervous and many of them with a low confidence, leave about an hour and half later, transformed and walking tall! It was amazing to witness and it wasn’t really until this point that I’d even considered a career as a Stylist, but knowing how much I loved clothes and fashion, and seeing the effect they had on Deb’s countless clients, I knew it was the right fit for me. Shortly after this revelation the fashion department advertised that they were looking for a full-time Personal Shopper (talk about perfect timing!) so I applied. I didn’t really expect that I’d get an interview, let alone get the job, but I did! And it totally changed my outlook (I want to type life but that seems a tad too dramatic!). My new manager, Deb, was supportive and inspiring and more importantly she challenged me – My confidence grew and grew and I loved getting up for work in the morning. Making people not only look fantastic but FEEL fantastic too, is so rewarding and enjoyable! I felt like I was finally on the right path…but after a couple of years I realized something was still missing. The service we offered was free so people would book appointments just for advice, yet as with most of these jobs, we had sales targets to meet and this conflicted hugely with my desire to help people no matter what their budget (I just want to say at this point that none of us ever pushed clients to make purchases they weren’t comfortable with!). I also couldn’t ignore the fact that taking people shopping was only solving half of the jigsaw puzzle for them, I knew that my clients had closets bulging with clothes that they weren’t wearing but undoubtedly could, and I wanted to fix that for them before they purchased new items. It was at this point that I made the daunting decision to leave my job and set up my own personal styling business offering both closet consultations and personal shopping. It was the best decision I ever made and I’ve never looked back. But you need to know that it is HARD. Even with the support of a loving husband and wonderful friends and family, it’s bloody difficult. Even now, 10 years on from launching my business, I’m still learning and overcoming obstacles, but I wouldn’t change it for the world. It is the most rewarding career and I flipping love it! Phew…still with me? Great! Give yourself a gold star! Now you know a little (a lot) more about how I became a personal stlist, I’m going to focus on you and your questions in the hope that I can help you move a little closer to turning your dream into a reality. These are questions from real people who have contacted me over the last 400 million months and I have provided my honest answers, advice and recommendations below. I’ll be updating this as and when I receive new questions so be sure to bookmark this for future reference! Q: I’m interested in becoming a personal stylist and I was wondering if you don’t mind giving me some advice – I already have a degree in fashion and textiles but no specific qualification in styling. Is it better to do hands on experience or do you recommend doing a course? I’m thinking of doing a 5 day course with the London College of Fashion. This is a great question and something I get asked a lot. I would say the most important and valuable learning you will ever do is to just go out and style as many people as you can, and as many different shapes, sizes, ages and styles as possible – ask family, friends, friends of friends…just get as much experience under your belt as possible. Styling yourself is one thing but dressing and styling other people? That is a whole other ball game. The more experience you get the more confident you’ll become styling different shapes and sizes and confidence is your friend when it comes to gently guide your clients out of their comfort zone. My first step towards running my own business was working as a Personal Shopper for John Lewis. I received a high standard of training and was working alongside one of the company’s top stylists. I styled, on average, 5 women a day, for a variety of different occasions from needing an entirely new collection of clothes, to attending weddings and special events. My clients ages ranged from the early 20’s right through to the late 80’s so I got a HUGE amount of experience. I learned about the cut of clothing and how it should sit on the body, which brands best fit which body types best and how their sizes come up, and I learned how to interact with different clients (and how to deal with tag along friends/mothers that think they know better) and it taught me that styling people isn’t just about looking good, it’s much more complicated than that – it can be such a personal and emotional experience for many women and I learned how to deal with that. I’m not sure I’d be where I am today without this wealth of experience, so I can’t emphasis enough how important hands on experience is! With regards to training, if you think you have a gap in your knowledge or need help turning your side hustle into a business, then I do think this is a worthy investment. While I had a ton of experience dressing women before I went it alone I had very little idea about running a business and I also wanted to update my skills, understand how to conduct a closet consultation and get a fresh perspective on personal styling, so I invested in a 2 week training course that did just that. So, yes, while your degree in fashion and textiles will stand you in good stead, I would definitely recommend doing some sort of training to fill the gaps in your knowledge. Shop around and find a course that caters most to your needs and I would steer clear of the courses that offer fashion styling rather than personal styling as these are more geared towards editorial styling than dressing personal clients. Q: Hi Niki, I decided early this year for a change in direction career wise. I currently work for a supermarket 30 hours a week and I work on being a personal stylist when not working. I had a bit of trouble with support from where I studied for my course, so I changed direction preferring to go it alone. I am currently working on my website which I need to design. Then I need new business cards and a business account, and I need to network. I want to get a job in fashion to support what I do and I also need to decide on an hourly rate as well as get more experience styling clients. What advice would you give me and do you think it’s realistic to do this on my own? First of all I want to say how sorry I am that you didn’t receive the support you needed from the people you trained with, that’s so disappointing to hear, but don’t give up! At this point you’ve already beaten most people and have taken a huge step towards realizing your dream; you’ve found your passion, have done the training and are fully aware of what you need to do to move your business forward, you’re just a little overwhelmed by it. But, you know what? Everyone who ever launched a business has gone through the same roller coaster of emotions and if they say otherwise, they’re lying. You just need a little focus and direction, and to know that you’re not alone! The first few months I started my business everything (even the smallest of tasks) overwhelmed me. I’d just finished some training and my head was whirling with ideas that I wanted to implement straight away but I just didn’t know where to start. I would try and take it one day at a time and go through my ‘to do’ list (which seemed endless) in a methodical way, but the truth was I was terrified and felt like I wasn’t getting anywhere. I had left my job to pursue this and the pressure I put on myself to succeeded was insane! I think the thing that kicked me into drive was reading the book Start your Business Week by Week, by Steve Parks it’s not ground breaking stuff by any means but it walks you through the steps, week by week, to getting your business idea off the ground. It broke everything down into bite sized pieces and forced me to write a business plan. I’ll be honest, writing a business plan wasn’t something I particularly wanted to do, nor did I feel there was much point in doing as I wasn’t looking to raise funds, but it was the best thing I could have done. It gave me some direction and focus, and it gave my business some structure. While we’re on the subject of books to read I also highly recommend Feel the Fear and Do it Anyway by Susan Jeffers, and Do Fly by Gavin Strange. In answer to your question about whether it’s possible for you to do this on your own – I believe it is but you don’t have to, not entirely. I was fortunate to have a fantastic community and great friends to bounce ideas off as a result of the training courses I did, however, the one person I used (and still use) as a sounding board the most is my husband. He has no experience of being self-employed (nor of personal styling) but having someone to check in with every so often to help get my head out of the weeds, to help me think about what I might have missed, or to just acknowledge how far I’ve come is invaluable. Reach out to your peers for advice and engage with other personal stylists on social media, (it’s a smashing place to find or create supportive communities!) but you might just find the most support comes from someone with absolutely no experience in your arena. I also want to tell you not to get disheartened if you feel it’s taking longer than you had thought it would to get things off the ground. No one tells you how hard it is to set up a business like this and if Instagram is anything to go by you’d be forgiven for thinking it’s easy – it’s bursting with pictures of personal stylists taking us around the shopping mall for the umpteenth time that week and talking about all the clients they’re styling – but you need to understand that us personal stylists know more than anyone how important image is and that spans beyond clothing to our brand and how it’s perceived. So but don’t be fooled by the pretty feeds and seemingly endless sessions with clients – behind the scenes, the part that rarely gets shown, is all the extremely hard work it took to find and secure those clients, and the weeks between seasons when things go quiet. It took me about a year, working on my business full-time, before I had anything that was close to resembling a successful, income generating, business with a strong client base. So, while I’d love to tell you there’s a straight forward path and that it’s easy, the reality is that it is bloody hard work, especially if you are trying to do this alongside working another job. But the flip side is that this truly is such a rewarding career and there is a huge market for what we do, so take it one step at a time. As for getting a job in fashion to support what you do, I’m not entirely sure that this is necessary. I suppose it adds weight to your credentials when it comes to impressing potential clients but unless the job involves styling people, I don’t know how much it will add – I’m sure some people will disagree with this but it seems to me that adding another task to your already long list of things to do is just going to create more obstacles. I would focus on getting as much styling experience as you can (with regards to fees, I’ve covered this in the answer below) and visit your local shops as often as you can to keep up with and try on the new stock to see how it fits. Keep doing what you’re doing, it sounds like you’re on the right path! Q: I have struggled with my fees and pricing (sale percentage vs. hourly rate?). How have you dealt with this? I was thinking hourly rate for closet consultations, and a percentage rate added to whatever was purchased from a shopping appointment. Aghhhh, deciding on fees and pricing is always a difficult task. I’ve played with mine quite a bit over the years and have finally settled on a structure that seems to work well for me. I charge a fixed amount for my closet sessions – these last 4 hours and anything over that is billed by the hour, and for my shopping trips I charge my clients by the hour and offer a minimum of 2 hours. I originally started out charging a fixed price for a set amount of personal shopping time but I found that this deterred potential clients who had smaller budgets and who weren’t looking to purchase an entire capsule collection. As for adding a percentage rate to whatever clients might purchase; my tagline is that I offer friendly, honest, impartial advice in a pressure free environment, so I made a decision on day one to never add a percentage rate to whatever was purchased and to NEVER take commission. I want my clients to trust that I will only take them to the shops which I whole hardheartedly believe are suitable for them, and will only encourage them to purchase the items that are 100% right for them. I believe that excepting commission of any kind and being paid through a percentage rate of what they purchase on a shopping trip has the potential to jeopardize this trust. And quite frankly, only being paid a percentage of what my clients purchase sometimes isn’t nearly enough payment, but at the end of the day you must do what feels right for you and what you believe is a fair price for your services. This job is extremely time consuming and tiring and is MUCH more than taking people shopping; I sometimes feel like I’m part councilor, part stylist. If you value your time, your clients will, too, so make sure you don’t undercharge. And once you’ve settled on a price, have confidence in it. I learned pretty quickly that if I sounded like I had any doubts about what I was charging, my client did, too. Q: How long did it take you to build a sustainable business or is this a part time situation for you? When I initially setup my business (over 10 years ago) it was extremely challenging and took me well over a year to get to a point where I had a sustainable business. Social media wasn’t a big thing at the time and my business grew predominantly through word of mouth (actually, word of mouth is still my primary way of getting clients) but once that chain started there was no stopping it. It became a full-time job for me after about a year and a half and continued to grow steadily year after year until I had maxed out the number of clients I could realistically see a week. It was at this point that I put my prices up and had to make a decision as to whether or not to hire a stylist to work with me. But before I was able to make that decision my husband and I moved to India (through his work). I did everything I could to maintain my businesses presence in the UK (I continued to write for a local magazine back home in the UK and I flew back to the UK to style clients) with the hope that we would return and I would be able to ramp things up again, but as is often the way with expat life, we didn’t go home, we moved to the USA instead – Pittsburgh, PA. And then, two years later we moved again, this time to South Carolina. Moving around the world quite possibly could have meant an end to my business but instead I’ve been able to retain my existing business in the UK and online whilst also establishing “new” styling businesses locally in a new part of the world. It’s been challenging re-establishing my business locally in each area with each move, but the beauty of this line of work is that it’s actually very flexible. There are lots directions one can take it in and it has a ton of potential and as such I’ve been able to adapt my business to suit our nomadic lifestyle, and have continued to grow and develop my business. If you have the passion and ability, and can see your challenges as opportunities, then I believe you’ll be able to build a sustainable business. Q: What have been your biggest challenges to overcome, things you wish you would have been better prepared for or aware of? This is a great question and I’ve covered some of them already in my answers to the previous question, but I there are definitely a few more to mention. The first challenge I’ve had to overcome is constantly having to explain to people what it is I do for a living and then trying to get them to see the value in it. I can’t tell you how many people question that someone can earn a living from personal styling…interestingly it’s often these same people who will flippantly ask me where they should shop for jeans or what colors they should wear (go figure)! I now answer them by asking them how often they’ve put an outfit on and felt confident and beautiful, and then tell them that a personal stylist will make you feel like that every day! The second challenge I wish I’d been more prepared for was just how hard it was going to be to get clients and build my business. I left my final training course with the opinion that the clients would come rolling in. Maybe I was naïve, maybe I was slightly misled. It was probably a bit of both. Either way, I quickly realized that, sure, I had this fantastic service that would change women’s lives but they didn’t know I existed, so they didn’t know to look for me. I spent a lot of time getting a website up and running, designing business cards and stationary and then I sat back and waited for the inquiries to roll in…and you know what? They didn’t. I panicked and then it dawned on me that having a website wasn’t going to cut it, I had to go out there and promote my services in person – I spent a lot of time networking and hosted workshops and talks, which leads me to my 3rd biggest challenge: public speaking! I’d spent my entire working life avoiding this at all costs and I was now in a position where the only way I was going to get my business off the ground was to get out there and tell people about my amazing business. I still hate public speaking to this day, and I still panic when the inquiries slow down, but learning to overcome all of these obstacles just made me and my business stronger and proved to myself that I COULD and WOULD build and grow a successful business. Q: Are there any major pieces of advice that you feel I should be aware of? Yes! I have 3 pieces of advice: The first is expect to be challenged on a daily basis, in both the day to day running of your business as well as the practical, styling side. I’ve been styling people for 12 years now and still come across a new body shape from time to time so my advice to you is what I tell everyone who emails me asking for advice – style as many people as possible. The second is: try not to give too much away for free. There is a tendency for some people to struggle to see the value in what we offer and if we offer our services for free this will never change. I understand that you might not be comfortable charging friends and family when you’re starting out, so ask them for honest feedback or to complete a questionnaire you’ve developed to help you improve. Q: I know you studied Textile design (I’ve done my homework and read your about page, LOL), but how did you transfer that knowledge to styling? I get so stuck on the fact that I don’t have a fashion degree of any kind. And: How do you get over that and establish yourself as an expert? I now I have a knack, but I have zero fashion training. I’ve worked in a vintage clothing boutique, and I help buy and do visual merchandising for my friends baby boutique, but that’s the extent of my background. So many people ask me if they need to have a fashion degree to become a personal stylist and the truth is, I’m not sure you do. Many personal stylists do come from a fashion background – I have a degree in textile design for one – but (and I can only speak personally) I don’t know how much my degree has helped me when it comes to personal styling. There is an understanding of color and composition gained through my degree that has definitely stood me in good stead, as well as an ability to identify trends and adapt them to suit different markets, but I wouldn’t say that it was necessary for me to pursue a path in personal styling. I think the thing to remember is that qualifications only really matter if clients require you to have them. At the end of the day you’re selling yourself to clients so figure out what they need to give them the confidence that you know what you are talking about, and that you have the required skills and experience to help them. Is a qualification going to give you credibility? Probably. And will it help you to establish yourself as an expert early on? It might do. But in all honesty I have never had a client ask me I have qualifications in fashion or personal styling so I have no proof that my degree sealed the deal. Nowadays the world is moving much more towards client reviews and feedback and it’s giving us as customers much more power. How many times have you purchased something based on its customer reviews? And have a think – would you be more likely to select someone to plan your wedding or build your house based on their qualifications alone, or several positive reviews and recommendations from friends? I wouldn’t let your lack of a Fashion Degree get in your way. If you have a knack for styling then build on that and get as much experience as you can by styling different shapes, sizes and ages. And if you feel you’d benefit from some training then I’d suggest investing in a Personal Styling course that will be far more targeted then a degree in fashion, and will arm you with the knowledge you need to turn your experience into a business. At the end of the day I think it’s a balance, I don’t think it’s worth investing the time and money in an expensive degree just to give you the credentials you think you need, but, if you have a gap in your knowledge then it isn’t as much about the qualification as the actual learning you will achieve from doing it, and that is worth investing in. Q: How did you grow your business and client base? 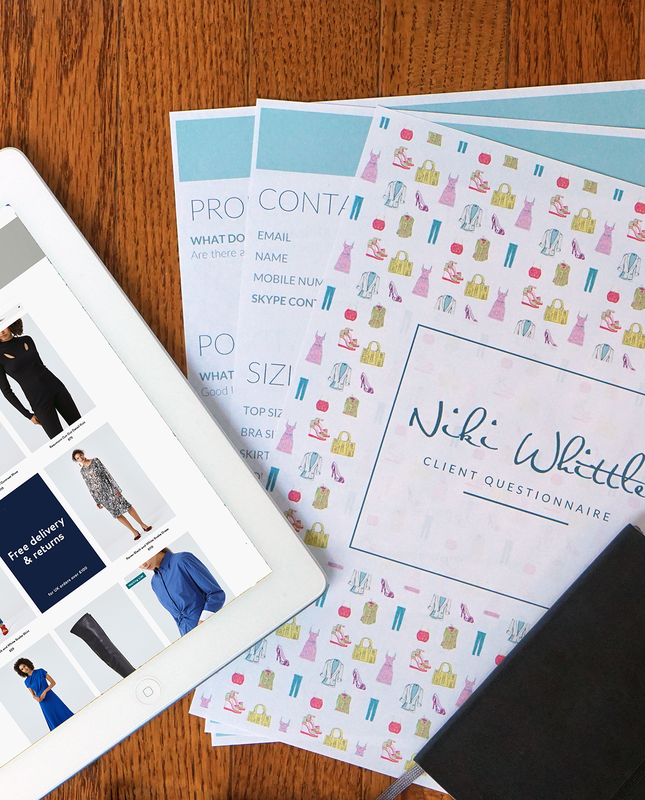 What structures did you put in your business as a personal stylist? Another great question! I started my business before the days of Instagram, and before social media was a big thing so the primary way of promoting my business was attending networking events, hosting workshops, getting involved with charity events and writing for local publications. In fact, the later was the best thing I ever did. A friend of mine, a fellow Personal Stylist who had trained at the same style academy as I had, originally run her own PR company and suggested I approach some of my local editors to offer my services as a fashion advice columnist, so I did. Only one of them showed an interest but that was all it took. We met for a coffee, I pitched my ideas, and the next thing I knew I was writing a monthly fashion column showing readers how to wear the trends. Initially I wrote for them for free in return for promotion, but eventually I got paid to do them. It definitely helped me develop a name for myself and grow a reputation as an expert in my field, and this in turn resulted in further opportunities such as radio interviews and writing for local papers. I also had a good number of clients book me after reading the column (I remember one lady in particular, showing me the items she’d purchased after seeing my column!). Yet, even with all this promotion, the biggest way I grew my client base (and still do today) is through word of mouth. If you can turn your customers into fans, they’ll sing your praises and promote your business for you! Q: How do you meet the right people to style and how do you make connections with PR places and showrooms to use their designers? Q: I’m struggling to settle on a name for my business, how did you choose yours? Oooh, this was difficult for me! I experimented with, Styled by Niki, Niki Whittle Style, The Bristol Stylist (I lived in Bristol in the UK at the time) but in the end I decided to just use my name as I felt it was more personable and gave me the ability to expand into other avenues easily if I wanted to. The one piece of advice I received that stuck with me with regards to settling on a business name and domain name, was to check it’s not unintentionally inappropriate when written as an URL – if you’re not too sure what I mean , read this article. Aaaaaaaaaand we’re done! I hope that’s given you an insight into running a personal styling business and has answered all the questions you have, but if not, please comment below and I’ll add it to the list for a follow up post if this is popular! Have you been to Bath lately?